These new furnishing options for the modern office respond to the needs of the worker, rather than the other way around. 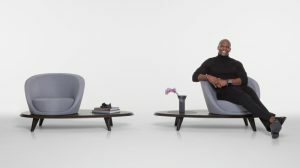 While he is best known for his television and movie roles, it might surprise some that Terry Crews also has a passion for art and design. For his inaugural collection for Bernhardt Design, Crews envisioned what modern contemporary furniture would look like through the lens of ancient Egypt. Inspired by the wildlife and landscape surrounding the Nile, the collection includes the wing-shaped Ibis sofa, Float coffee and end tables, 16-inch-high Aire Benches, and Lillypad and Lily lounge chairs, which may be specified in Bernhardt Textiles leather and fabrics or the customer’s own material. Oregon-based Studio Gorm has collaborated with HBF to create the Studio Table series of solid wood standing-height tables. Inspired by Shaker furniture, Studio’s tabletop features a split down the center that works as a design element while giving users an easy and discreet place to access power on the second, lower shelf, where they can also store bags or other items. The standing-height table allows for informal standing meetings or laptop working and can be paired with stools for dining or longer work sessions. Jabbrrbox is a private, technology-equipped workplace ideal for today’s increasingly mobile workforce. Scaled for one worker and ideal for conference calls or a quiet space to work between meetings, the 48-in-x-48-in-x-90-in Jabbrrbox One comes pre-equipped with a Philips Hue Bridge, power outlets, USB charging ports, and up to 224 CFM of airflow. The enhanced Jabbrrbox Chromebooth option features a 24-in Google Chromebase. The exterior of both versions is available in nine powder-coated colors, with custom materials and wrapping available. Additional sizes and models will soon be available. 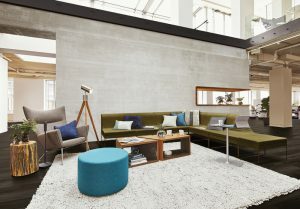 Steelcase and Microsoft have unveiled five new “Creative Spaces” designed to support the needs of individuals and teams as they move through the different stages of the creative process. The spaces include: Maker Commons, designed to support conversation, experimentation, and concentration; Duo Studio for working in pairs (includes a lounge area); Focus Studio for individual creative work; Respite, a truly private room with a relaxed, residential feeling; and Ideation Hub, a high-tech space that encourages collaboration with on-site or remote teammates via the Microsoft Surface Hub. 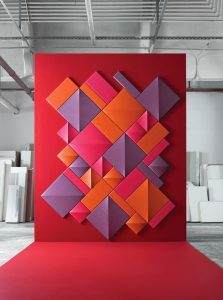 Carnegie has added three new panel shapes — Diamond, Square, and Plank — to its Xorel Artform acoustical panel system for dimensional wall or ceiling installations. Also available in a 3-D option in certain shapes, the panels are made of Cradle to Cradle Certified Xorel high-performance textiles that include a bio-based option. Xorel Artform now comprises seven shapes in 19 sizes and more than 300 standard Xorel patterns and colors. Designed by Richard Holbrook, the award-winning Prospect portfolio includes semicircular free-standing furniture to help foster collaborative and individual creativity in small-to-medium-sized teams. 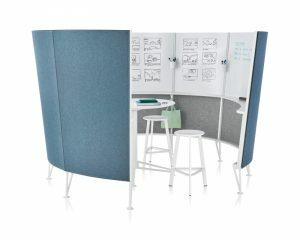 Featuring a strong, lightweight aluminum structure and soft, sound-absorbing surfaces, Prospect comes with whiteboards and tackable surfaces in four different formations: the Solo space (a small, one-person circle with a desk built in); an 8-panel or 4-panel collaboration space; and the media cove, which has a built-in table and the ability to mount a monitor.